This prayer of David's captures the mood of 2 Kings and 1 Chronicles. Repeatedly, David learns the hard way that sin has consequences. It affects his relationship with the people of Israel, with the members of his family, and with God. But the main message of these books is not human failure, but divine faithfulness. As David experienced time and time again, with God there is the possibility of restoration. Many years later, Isaiah expressed this truth eloquently. As you follow David's life in this book, you will discover that what was true for David is true for you, too. No matter what has happened between you and God in the past, restoration is possible. So prayerfully ponder the truths in this book, and Be Restored. 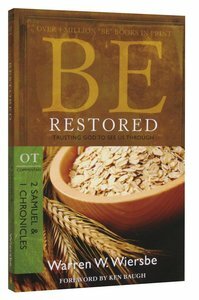 About "Be Restored (2 Samuel/1 Chronicles) (Be Series)"